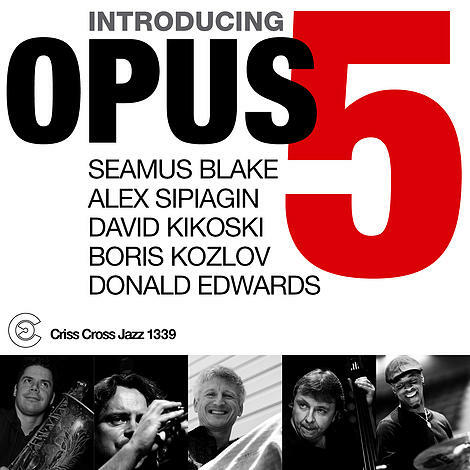 An empathetic power of five is at work in the collaborative project known as Opus 5, working in the long shadow of the great vintage quintets, ala Blakey and pre-electric Miles Davis. On the front line, tenor saxist Seamus Blake and rising star trumpeter Alex Sipiagin - a Russian in NYC - are bolstered by pianist David Kikoski, drummer Donald Edwards and another bold Russian émigré, bassist Boris Kozlov. In the song set are compositions by bandmembers, George Cables' " Think of Me ", Braziliana by Toninho Horta, and the reborn Russian folk tune " Sokol ". Honoring the Russian roots within the band.